If you’ve been around this lovely thing called the Internet for a while you probably already know that Amazon is a great source to earn cash by affiliating products. Running an Amazon affiliate website is no easy gig, but it has huge earning potential; so it can be a lucrative endeavor for those dedicated and willing to put in the work. To start things off right, however, you need a powerful WordPress theme to help you put your best foot forward. And we’ve got just the tools to help. Here are the best Amazon affiliate WordPress themes on the market. Azassociate is an amazing WordPress theme with full Amazon API support. It facilitates the creation of Amazon partner stores by harnessing Amazon's Product Advertising API. Creating an Amazon review niche site is a total breeze. It fully integrates with WooCommerce and and a custom built Amazon product importer allowing you to import unlimited products from Amazon with a few clicks. What we liked most about this theme is it’s flexibility. It can help you create an Amazon WordPress store for almost any product you could think of. Some examples would be: running gear, nutrition supplements, kitchen appliances as well as movie reviews. An awesome deal for a theme that’s been rated with 4.6/5. Rounding up our list of the best Amazon affiliate WordPress themes, Authority Azon isn’t only functional, but also nice to look at. Its polished design makes it stand out from the crowd, and the theme features will allow you to save time when setting up and managing your website. You get product data from Amazon with just one click, can create optimized review pages that drive clicks, and make the most out of your traffic with Amazon link localization. Pretty cool. This theme promises to help you create professional Amazon affiliate Stores in less than 5 minutes, so it’s an appealing choice right from the get-go. You can search for products directly from WordPress dashboard and import them into your store with just a few clicks, so you will be up and running in no time. Furthermore, Zeno is user and SEO friendly, fast, responsive, and very easy to manage. What are you waiting for? Storycle is an impressively functional and feature-rich WordPress theme that's best suited to be used for the launch of information-rich news portals, online magazines, and blogs. A clean and fresh layout of the theme is made to be fully responsive. The theme runs on WordPress 5. It's made to be fully compatible with GDPR and Gutenberg. It includes the Elementor page builder that allows you to modify the pre-built layouts without touching a single line of code. Additionally, the theme includes a collection of premium Jet plugins, which you can use at no cost at all. There is a growing number of topic-specific demos available in the theme's download package. All pages and layouts are ready to be adjusted according to the specific requirements of your own brand. Imperion is the ultimate WordPress theme that is apt for a range of business and corporate online projects. A sleek and clean layout of its pages is perfectly suited for establishing a professional and trustworthy online presentation for your venture. The theme is ready to be handled by the users of all skill levels perfectly well. It includes Elementor page builder and a number of Jet plugins, which provide for the code-free modification of the theme's layout. It won't take you plenty of time to install the theme on your site. Streamlined installation of the theme's elements is delivered by TM Wizard plugin. Imperion theme contains a collection of topic-specific skins that are ready to be applied for a range of business ventures. If you look forward to establishing a clean and professional presentation for your creative portfolio site, then Insights WordPress theme will be the perfect choice for you. It features a minimalist and well-balanced layout that will bring the main focus of the users' attention to the content that's provided on your site's pages. The theme runs on WordPress 5. It's made to be fully compatible with all the major features of Gutenberg editor. Additionally, it makes it extremely quick and easy to modify the pre-designed layouts owing to the built-in Elementor page builder. Choosing this theme, you do not need to worry about the way your content will be adjusted to different screen sizes. This is made possible due to the fully responsive and cross-browser compatible layout of the theme. 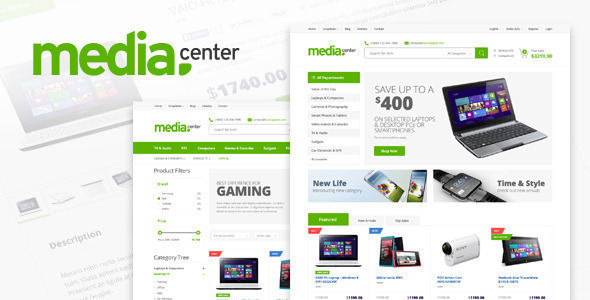 Media Center affiliate WordPress theme is an amazing choice for anyone looking to start an affiliate business. It features a clean design, with a green-ish color scheme, and has a tried & tested shop layout. It’s very similar in terms of layout to Amazon or eBay and is powered by WordPress. Integrates nicely with WooCommerce & offers great video documentation for faster & easier setup. Give this affiliate WordPress theme a go – see how it feels. 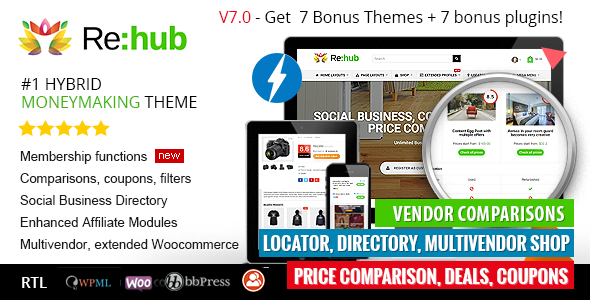 REHub is a hybrid WordPress template with enhanced affiliate, coupon, and directory functions. Being one of the best moneymaking themes out there, it comes packed with a plethora of features you can use to build anything from an online store to a comparison website. It has different options for affiliate earnings, it supports three shop plugins (EDD, Ecwid, and WooCommerce), and bundles Visual Composer so you can easily set up and manage your page. 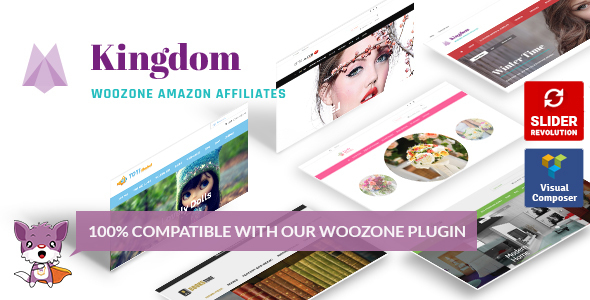 This theme was created to work perfectly with the WooCommerce Amazon Affiliates plugins, so it’s not loaded with any unnecessary features and functions. Its basic purpose is to enable you to build a WooCommerce store and sell anything from Amazon as an affiliate, and it does just that. You can import customer reviews and additional information from Amazon for more customer information, implement an eye-grabbing homepage slider to retain visitors, and easily personalize your store to best match your preferences. This is as simple and straightforward as things get. One of the most modern and slick Amazon affiliate WordPress themes on the market, Rethink V2 covers all your needs and helps you set up your store in a jiffy. It enables you to show product reviews with a rating system and there is a banner space for ads on the home page for maximum monetization. You can display any number of products in the form of product videos, opt-in-forms, images, and so on. Other highlights include a beautiful slider, a link cloaking feature, and an easy to use interface. Digi Seller is a great WordPress theme, whether you’re looking to sell your own good online or start an affiliate program. You can use the included Digital Downloads plugin or use the eJunkie cart or link to Amazon and also implement a powerful search function so customers can quickly look up products on your site. Digi Seller is compatible with most of the popular WordPress plugins, translatable, and built with the best SEO practices in mind. Plus, the design is polished and eye-grabbing, so your clients will likely come back for more. This is a theme that allows you to easily build your affiliate store or price comparison website easily. With a minimal investment of only $49 you can start making money off of Amazon products or any products you’re affiliated with. Price Compare tightly integrates with Amazon Associates, Clickbank, eBay, Shareasale, Rakuten Marketing & even Affiliate by Conversant. Multiple payment gateways are supported, such as: PayPal, Skrill, Stripe & iDeal. A great value package for anyone looking to acquire an Amazon theme that’ll make their shop stand out from the crowd. It’s fully responsive too. An extensive options panel, endless customization opportunities, built-in Amazon link localization – Ultimate Azon offers all of this and more. The theme was specifically designed with Amazon affiliates in mind, so it’s got all the tools you need to create a beautiful and powerful store. It comes pre-loaded with a number of preset style configurations that you can activate with a single click from the dashboard and it also allows you to create your own custom product specifications and attributes. All in all, one of the best Amazon affiliate WordPress themes out there. 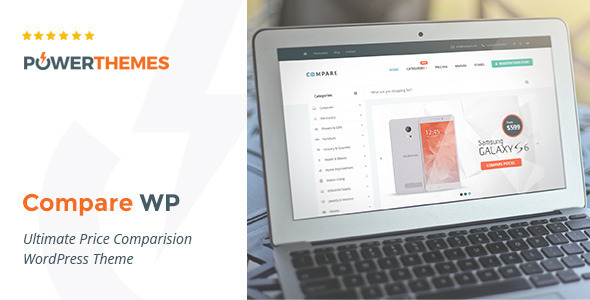 As one of the most powerful Amazon affiliate WordPress themes on the market, Compare comes packed with an impressive array of custom options and widgets. Whether you’re a novice or experienced affiliate, the theme has you covered. You can manually add products and import your CSV product feed, control content layout, manage your own advertising, pull in your latest tweets, show your latest video, display your latest photos, and more. It’s easy to manage and customize; plus, it’s price comparison functionality is pretty neat. Stored was built to take full advantage of the Cart66 eCommerce plugin, helping you build a great store that showcases products front and center. Affiliate Mode makes it easy for affiliates to create products and link the Buy Now button to another website with your affiliate link. As easy as copy and paste. Other notable features include responsive widgets on the home page, easy setup, and great support. Why Choose One of the Amazon Affiliate WordPress Themes on Our List? Investing in a premium theme makes sense. You need to spend money to make money. All the entries on our list come with great design and awesome functionality, so you can get your site online fast and without any outside help. The Amazon affiliate WordPress themes above perfectly fit the requirements for an Amazon affiliate, are developed particularly for this niche, and pack powerful features that will help you turn visitors into conversions. Any one of them is a perfect pick for entrepreneurs looking to earn cash by recommending Amazon products. You know what’s the best thing about WordPress? It’s so user-friendly that you can create complex websites without the help of a dedicated team of designers and developers. You just need the right tools. Our Amazon affiliate WordPress themes will help you customize and launch your store without too much hassle. Hence, you’ll be earning money in no time. For more WordPress tips and tricks keep browsing our site or subscribe to our newsletter. I have been using one of these themes for my website, and I found it really a great help, I am making a good numbers using the theme Zeno for this site goodcarts.com. I recommend people to use it. Wow that is really cool. Building amazon niche site is a nice idea. I’m actually planning on building one. Wow, you’ve definitely done your research on the best Amazon affiliate themes. I’ve used Kingdom before and I highly recommend it. is there any free theme? none of the above are free themes, but there are cheaper options like Authorithy Azon and Ultimate Azon themes. This doesn’t mean they’re worse themes than the others. yep, they’re pretty much the new kid on the block. Their product seems very well polished and they do mean business. A lot of attention has gone into building their product, judging by their sales page. If you decide to give them a try, please come back and share your thoughts with the rest. I’d love to hear them. Anyone have issues with Kingdom Version 3.3? I can not find the layout button. I think rehub is the best option… I have been using it on my website and its really good and ussr friendly. Be really careful with Ultimate Azon – there is no current documentation on it (it’s years old) and it’s difficult to use. @Mary – that’s why we’re actually recommending AzAssociate :) It’s one of the best Amazon WordPress themes on the market. i There any Word press theme that can be used from multiple affiliate programs(like amazon ,ebay, aliexpress) in the same website together ?